Do-it-yourself trends are all the rage right now to make your life easier while saving you money. Although many DIY videos and tutorials are excellent for helping you to complete improvements around the house on your own, they are no substitute for medical or dental treatments. Now, you will find many claims on social media that show you how to effectively move your teeth without a dentist in San Antonio. However, while they may show you the benefits and the end results, rarely will you see the damaging complications of at-home orthodontics. If you want a healthy, straight smile, it is best to leave your treatment to the professionals. “Do-it-yourself” teeth straightening is among the latest trends to hit the internet, claiming to offer a quick fix without the need for a dentist. However, it is also among one of the most dangerous new trends that can cause irreversible damage. In 2015, the American Association of Orthodontics responded to the tutorials found online regarding at-home teeth straightening methods, stating that consumers are putting their teeth, gums, and jaw at risk. You will find many videos online showing how to move the teeth with materials you can find right at home, like rubber bands and paper clips. Some are even going a step further by 3D printing their own clear aligners. While it may seem like the affordable and effective solution, it is no substitute for professional training. As a result, you risk the loss of your teeth, infections, tooth decay, and gum damage if you try these trends on your own. The movement of the teeth requires a specialized treatment plan to prevent damage while ensuring the proper alignment and bite. Without formal education, there is no way to safely move the teeth without causing damage. 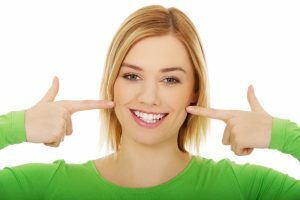 Although these videos may seem like the perfect solution to give you your dream smile, it is best to see a professional for a safe and effective treatment. One of the biggest complaints regarding traditional braces involves their appearance, restrictions, and lengthy treatment process. Now, new advancements allow you to get a straight smile without metal wires and brackets. As a result, you will have a nearly invisible treatment that does not have the same restrictions as standard braces while allowing you to move your teeth in less time. With Invisalign, clear plastic aligners are worn over the teeth to gradually move them into position. They are virtually unnoticeable while providing a quick and convenient treatment. In as little as a year, you can have the straight smile you have always wanted without the damaging complication of DIY braces. If you are ready for a straight, healthy smile, leave it to the professionals and call your dentist for a consultation. At Jones and Knight DDS, we provide family, cosmetic, and implant dentistry to create healthy, beautiful smiles. We offer many areas of specialty, including orthodontics with Invisalign. If you have any questions about your options for braces, please contact our office to schedule a consultation.